Do I need a Pool Cover Roller? Why? You are at:Home»Pool Covers & Rollers»Do I need a Pool Cover Roller? Why? 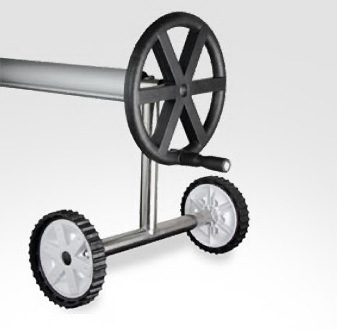 If you’ve ever owned or installed a pool cover, then you already know that you need a pool cover roller. It’s a no brainer. For those that haven’t had a pool cover before, let me go through the pros and cons of having a pool cover roller. Get the maximum benefits from your pool cover – it’s simple, to get all the benefits you bought the cover for like warmer water, reduced cleaning time, reduced pool running expenses, you must use your cover. You need to keep it on whenever you’re not using the pool. For most people, you’ll only do this if the cover is easy to take on and off. A cover reel allows a cover to be taken off in less than a minute in most cases. Without one, it will take 10 minutes or more. And then you’ve also got the job of trying to fold it up and store it. Which is about 10 times harder than folding bed sheets. Reduced Wear and Tear – A pool roller will evenly distribute the loadof the cover when removing it. It will also neatly roll the cover up making it easy to store when not using it. Without a roller, you risk tearing and scraping the cover on rocks, paving or fences. And that’s even more likely when trying to get it through a pool gate, which is not a great idea to start with. Considering the average cover is 5 times wider than a pool gate. Pool Rollers Can be Pricey – Yes this is true. In Australia they generally cost $250 to $550 for a manually operated one or $800 to $5000 for an automated pool cover roller. Although they can be expensive, the lower priced manually operated pool blanket rollers will be just fine for most people. Takes Up Space – Pool cover rollers can take up some space at the end of you pool. For some people a roller isn’t practical because it won’t fit. For those with limited space there’s another option, it’s called a hidden or in ground pool cover roller. So rollers can be recessed into the ground. This results in a flush seamless finish and is barely noticeable. Looks Ugly – Pool cover rollers can look a bit ugly. You can limit this by buying a nicer looking one. Or, as explained above, you could get a hidden pool cover roller. There are only a couple of cons of buying a pool cover roller. For most people wanting to know if they need a pool cover reel, the benefits far outweigh the cons. If you’re going to regularly take your cover on and off then I highly recommend a pool cover roller. They’re available in most swimming pool shops, online and also on our website.